Tom and Linda Hopfenspirger in their hathering room with Ophelia. Renovating/restoring four previous homes had been a challenge for Tom and Linda Hopfenspirger, but constructing their fifth home was a delight. With each project, rolling up their sleeves was the common dynamic. Plastering, painting, and sanding, no task was too large for the energetic Hopfenspirgers. Over time, they developed a singular formula of design. Linda, owner of Gilded Lilly Floral Designs, utilized her artistic skills to create each interior. Tom, a retired Navy commander, applied military precision to each task's execution. "We never ever did it the easy way. If there was an easy way it was not the Hopfenspirger Way," he says with a laugh. Hand-finished wide-plank flooring is a Hopfenspirger design essential. Achieving the floor's desired patina requires a mixture of three stains. The stain is applied by hand, and then wiped. Next, layers of polyurethane are applied in three coats. By sanding and buffing between subsequent coatings, the floor's durability is assured. Their fifth home was newly completed and Tom felt settled. His sanding/staining days were a distant memory. 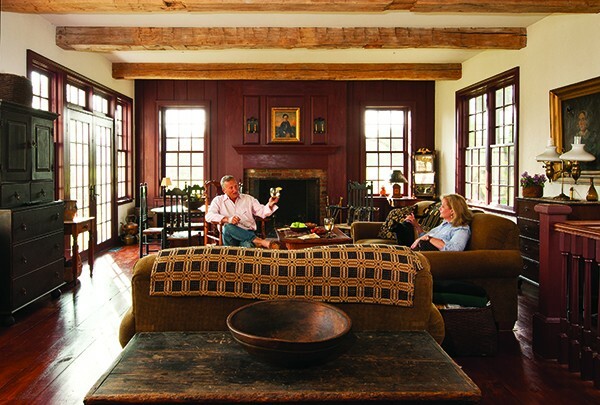 Through the course of a six-year renovation the Hopfenspirgers transformed Lang Syne from a 1930s Dutch Colonial into a home more indicative of 18th-century Hudson Valley architecture. "Honey, we're moving again," proclaimed the excited Linda. Tom's quick reply was, "Oh great, where?" Those three words sealed the family's fate. Earlier in the day, Linda's fall garden planting had been interrupted by a call from Vicki St. John-Gilligian. The two lifelong friends share a love of antiques, interiors, and homes. A new listing on Leggett Road in Stone Ridge had sparked St. John-Gilligian's attention. "Growing up in Kingston, I had always loved the trees along Leggett Road," says Linda. Leggett Road, a country lane hallmarked with stately homes, has long been considered a best address in Ulster County. "The minute I crossed the threshold, I felt warmth and the love of family," says Linda. "The house's positive karma was immediately evident," remembers Linda. The sense of home, the location, and the surrounding 36 acres were perfect. The address, 86 Leggett Road, sealed the deal. "In a restaurant when the chef 'eighty-sixes' a steak, that means there are no more steaks. Tom and I met while I was working in a restaurant, so the address 86 was another sign it was meant to be." 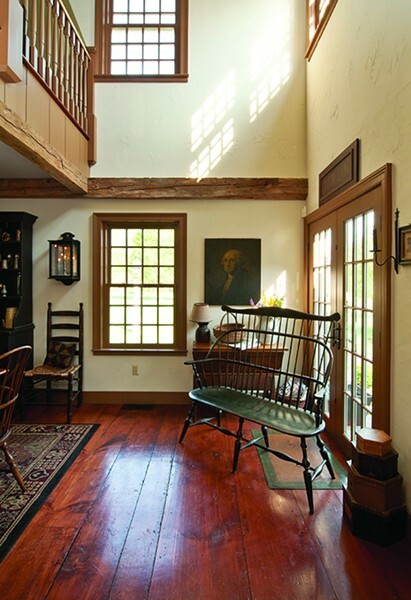 12-over-12 windows, hand-stained wide-plank flooring, and 18th-century barn beams are featured throughout the home. When philanthropists Kenneth and Whitt Davenport christened their home Lang Syne in the 1930s, the name was not a salute to the New Year's Eve standard, but an homage to the purported original name of Stone Ridge. The Dutch Colonial had an inescapable charm from the onset. Erected on the foundation of the oldest clapboard house in the surrounding town, the home featured salvaged architectural detailing, Dutch doors, and hand-forged ironwork. Whitt Davenport, daughter of legendary Mississippi congressman William Whittington, was the epitome of Southern hospitality. For 70 years, Lang Syne was beloved by friends and family alike. Politicians, musicians, and artists were frequent guests. Lang Syne had become synonymous with graciousness. "I would like to see my parents grow old here," wrote Mehren Hopfenspirger to the Davenports. Stuck in a bidding war, the Hopfenspirger's nearly lost Lang Syne. 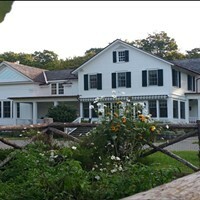 Mehren's thoughtful letter to the Davenport Estate closed the deal. 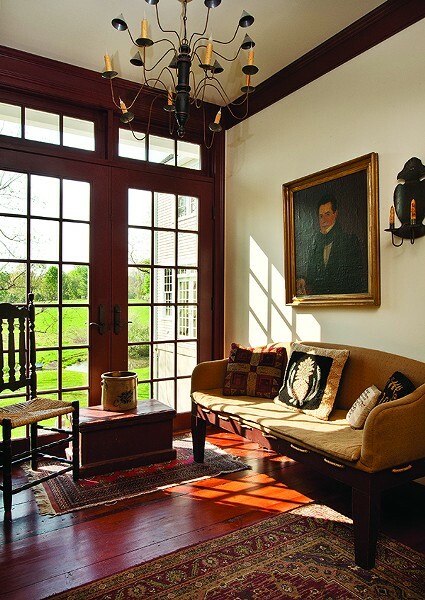 In the sun-drenched mud room, high-country antiques are paired with a circa 1820 portrait. On moving day, the temperature was seven below zero. Trudging through three feet of snow with their possessions was not ideal, and family lines were drawn. Daughter Mehren and Linda felt thrilled to have Lang Syne. Son Kurt and husband Tom remained skeptical. Kurt, a freshman at Coleman High School, missed the media room of their former home. Tom, owner of a media distribution business, felt overwhelmed. Kitchen and bathroom renovations were nothing to Linda. The spring discovery of nesting bees within the home's walls was not a problem for her. Linda's spirits would not be dampened. Meetings with architect Michael Lockwood and builder Benjamin Stanfield were fruitful. All was right with the world. Then the proverbial Pandora's box of renovations opened. Its lid came crashing down loudly upon them. To accommodate the proposed roofline of the home's new addition, the entire existing roofline would have to be raised 10 feet. Surveying the footings of the rear addition, Tom found the footage was "too short." Willing to compromise to maintain the peace, Linda agreed to increase the square footage by eight feet. The kitchen's expansion was hampered by the discovery of the Rosendale cement foundation. "Rosendale cement is the toughest, most nonpenetrable cement in the world," Linda says. Jackhammers arrived on the scene. Each day was a journey. Tom was discouraged. Mehren joked, "ABC completes an 'Extreme Makeover' in one weekend. Why can't you?" "It reached the point that Tom would literally crawl through the basement window to enter the house. Anything to avoid the builder and architect," said Linda. 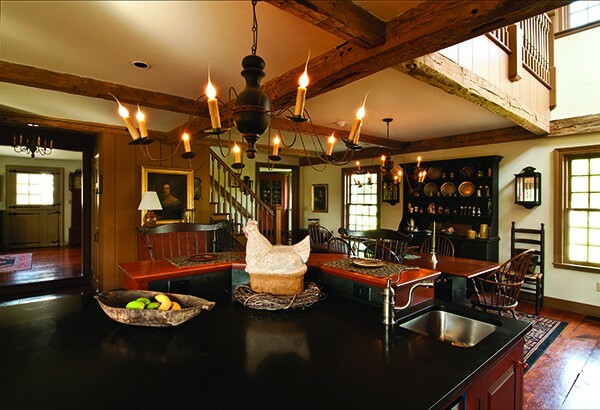 The furnishings of the home’s ample sized kitchen convey a sense of warmth and tradition.